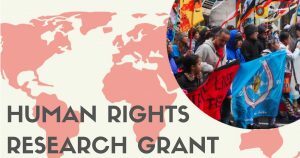 Apply For A Human Rights Summer Research Grant! Currently enrolled Duke undergraduate and graduate students are invited to apply for summer research funding from the Duke Human Rights Center@FHI. The goals of the grant are to strengthen global research opportunities for students interested in developing, implementing and working in human rights. Special consideration is given to students whose research contributes to a senior thesis or project, or towards the research component for the Capstone for the Human Rights Certificate. Grants are available of up to $2,000. Applications are due March 1, 2019. Learn more. Human Rights Summer Research Grants take undergraduate and graduate students from Duke all over the world. Check out the interactive map above to see where students have traveled. Click on the pins to learn more about each student and their research!